Go to original pattern for design DROPS 94-10. Because of the weight of the yarn, the poncho will “grow” approx. 5-8 cm when you put it on, compared to measurements in measurement chart. Accessories: 3 buttons approx 2 cm in diameter to crochet round. Crochet Gauge: 12 tr x 7 rows with 1 thread of Alpaca and 1 thread of Cotton Viscose = 10 x 10 cm. 12 dtr x 5 rows = 10 x 10 cm. 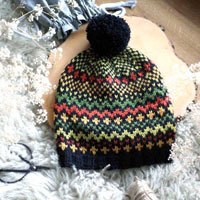 1 report in pattern = width approx 12 cm. Crochet info: At the beginning of each row substitute 1 dc with a ch, 1 tr with 3 ch and 1 dtr with 4 ch. 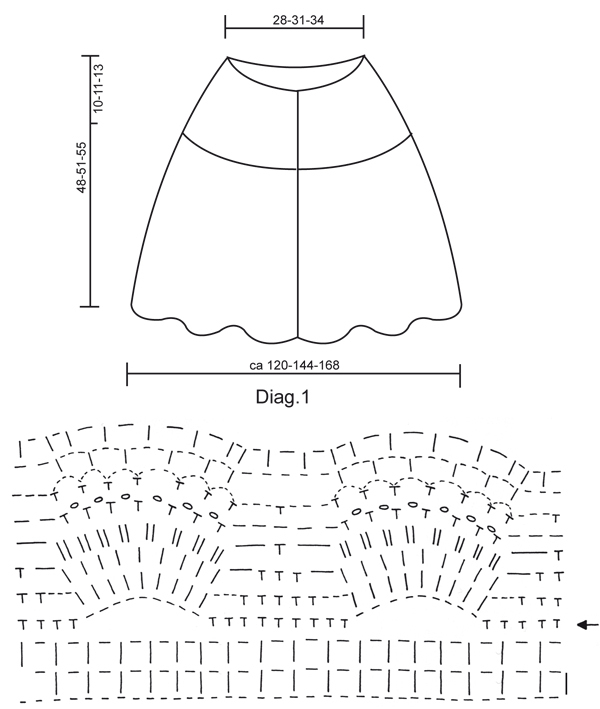 Pattern: See diagram 1 – diagram 2 shows the repeat in the width. Crochet the piece from the top and down. Size M/L: Inc 1 tr in every other tr but finish with only 1 tr in the last tr = 110 tr. Crochet 1 row without inc. On the next row inc 1 tr in every 3rd tr = 146 tr. Crochet 1 row without any inc. On the next row inc. 1 tr in every 4th tr = 182 tr. Crochet 1 row without any inc, and on the next row inc. 35 tr evenly distributed on row = 217 tr. Size XL/XXL: Inc 1 tr in every other tr but finish with only 1 tr in the last tr = 122 tr. Crochet 1 row without inc. On the next row inc 1 tr in every 3rd tr = 162 tr. Crochet 1 row without any inc. On the next row inc. 1 tr in every 4th tr = 202 tr. Crochet 2 rows without any inc, and on the next row inc. 51 tr evenly distributed on row = 253 tr. When all inc. are complete the piece measures 10-11-13 cm. Now crochet pattern – see diagram 1. 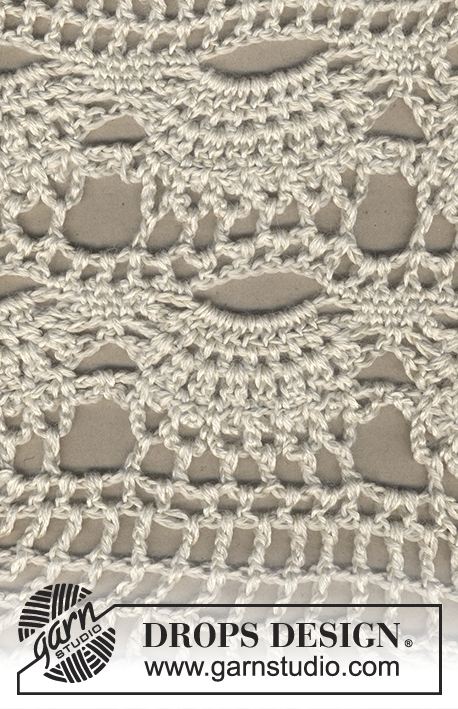 Crochet 2 repeats, but start the second repeat in the row marked with arrows. Now crochet 2-3-4 rows of dtr as follows: NB: If you want to adjust the length of the poncho either add or subtract a row of dtr’s. 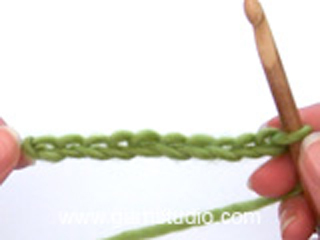 1st row: Remember crochet info: Crochet 1 dtr around each ch-loop with a ch in between = 90-109-127 dtr, turn the piece. 2nd row: Crochet 1 dtr into each dtr but instead of 1 ch in between crochet 2 ch’s – Size S/M finish here before the last pattern repeat = 91 dtr’s. 3rd row: Crochet a dtr in each dtr but now crochet 3 ch’s in between each dtr instead of 2 ch – size M/L finish here before the last pattern repeat = 109 dtr’s. 4th row: Crochet 1 dtr into each dtr with 3 ch’s in between each dtr. 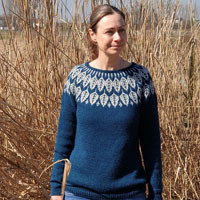 Size XL/XXL finish here before the last pattern repeat = 127 dtr’s. After the last row of dtr crochet Diagram 1 again from the beginning, but finish the pattern after the 7th row in diagram – NB: Crochet 1st row in diagram as follows so the pattern fits: 3 ch (=1 tr), 1 ch, *1 tr around the ch-loop, 1 ch, 1 tr around the next ch-loop*, repeat from *-* to the end of the row = 180-216-252 ch-loops. Buttons: Crochet a “cover” for the 3 buttons with Cotton Viscose as follows: Crochet 2 ch, continue to crochet 16 tr in the 1st of the 2 ch crochet, finish off with a sl st in the top of the 1st tr (= 1st round 1). 2nd round: Crochet 1 dc into each tr and finish off with a sl st in the 1st dc from beginning of round. 3rd round: Crochet 1 tr into every other dc and finish off with a sl st in the 1st tr from beginning of the round = 8 tr. Put the buttons into the cover, sew around the edge and pull together. Sew the buttons on the right side of the poncho. The top button should be approx 1 cm from the edge and leave 4-6 cm in between the others. Button loop: Crochet loops for the buttons on left side as follows: 1 dc in the corner of the neck, 1 dc into the same st, *4 ch, skip 3-3.5-4 cm, 1 dc in the next st*, repeat a total of 3 times - a total of 3 loops matching the location of the buttons. 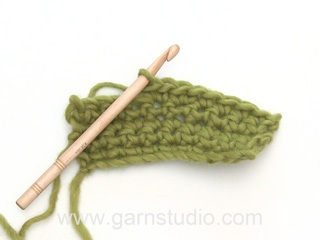 Drops crochet hook size 3 mm for the buttons and size 5 mm for flowers and chain. Drops mother of pearl button, no. 521: 2 pcs. Accessories: 1 button approx. 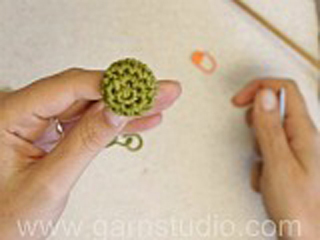 2 cm in diameter to crochet round. Flower: Crochet 4 ch on hook size 5 mm with 1 thread of Alpaca and 1 thread of Cotton Viscose and make a loop with a sl st.
1st round: 3 ch (=1 tr), crochet 13 tr around the loop and finish with a sl st in the 3rd ch from beginning of round. 2nd round: *4 ch, 1 tr in the 1st of the 1st of the 4 ch, skip 1 tr, 1 dc in the next tr*, repeat from *-* a total of 7 times but finish with a sl st in the sl st from the end for the previous round (instead of a dc in the next st) = 7 leaves. To make a small loop on the backside of the flower, use the thread end from the beginning and crochet 1 dc in the centre of the flower, 2 ch, and attach with a sl st.
Chain: Crochet 2 ch on hook size 5 mm with 1 thread of Alpaca and 1 thread of Cotton Viscose, crochet 1 sl st and 1 dc in the 1st ch crochet. Continue with ch’s until the chain is approx 60 cm and finish with a dc and a sl st in the second but last ch. Cut and sew the threads. Crochet 2 flowers – see explanation above. Sew a mother of pearl button in the centre of 1 flower and pull them on the chain. 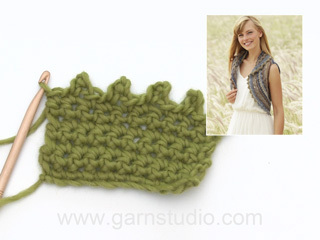 Crochet a button with 1 thread of Cotton Viscose on hook size 3 as explained under Poncho. Crochet 1 loop on the backside of the button the same way as done for the flowers and pull the button on the chain. Bracelet: Crochet 2 ch on hook size 5 mm with 1 thread o Alpaca and 1 thread of Cotton Viscose. Crochet a sl st and a dc in the 1st crochet ch. Continue with ch’s until the bracelet measures 35 cm and finish with a dc and a sl st in the second last ch. Cut and sew the thread. Crochet 1 flower – see explanation above. Sew a mother of pearl button in the centre of the flower and pull it on the bracelet chain. Hi. 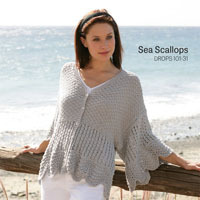 I'm very lost on the desert bloom poncho pattern. I'm making the XL pattern and completed the 253 stitches. I'm not clear on how to proceed after that. The pattern says to refer to the diagram but then lists out 4 rows to do. I'm also confused in the diagram as to whether or not to begin each dc in the dc from the prior row and when I need to skip them ( which obviously happens). Any help you can give would be greatly appreciated. Thank you. Dear Sandra, when you have the 253 sts crochet diagram A a total of 2 times in height (starting 2nd repeat in row with arrows) - then crochet 4 rows of tr as explained., then crochet diagram 1 one more time as explained. Happy crocheting! Gr. S/M: 1 Stb. in jedes 2. Stb. zun., aber in dem letzen Stb. wird nur 1 Stb. gehäkelt = 101 Stb. Leider verstehe ich nicht wie das sein sollte? Heisst dies ich häckele in jedes 2te St. zwei Stäbchen? Liebe Frau Goedert, ja genau so wird es gehäkelt: *1 Stb in das nächste Stb, 2 Stb in das nächste Stb*, von *-* wiederholen bis 1 Stb übrig ist, dann 1 Stb in das letzte Stb häkeln. Viel Spaß beim häkeln! Hoi Jet. De horizontale lijnen op de laatste toer zijn lossen (net zoals de eerdere lijntjes/lossen - deze zijn alleen een beetje groter). Hallo, ich habe eine dringende Frage. und zwar im Diagramm 1 in der Reihe 5 und 6 sind diese lagen Striche ein kleiner Strich bedeutet eine Luftmasche aber was bedeuen diese langen Striche in Reihe 5 und 6, wieviel Luftmaschen sind das dann 1 oder mehrere. Bin gerade etwas iritiert.. Über eine baldige Antwort würde ich mich sehr freuen damir ich schnell weiter häkeln kann. Vielen lieben Dank und verbleibe mit freundlichen Grüßen. Liebe Fatima, jeder Strich, ob kurz oder lang, ist 1 Lm. Also sind auch mittellange und lange Striche je 1 Lm. Weiterhin gutes Gelingen! Bonjour, Je réalise la taille XL, je viens de finir R4 avec DB et 3ml et j'ai 127 DB. J'ai un souci pour continuer avec le diagramme : sur le diagramme il ne faut donc pas faire le tout 1er rang de mailles serrées? 2eme question, si je réalisé comme c'est écrit "1B dans l'arceau suivant, 1 ml, 1B dans l'arceau suivant", je n'obtiens pas 252 arceaux... ne faut il pas réaliser 1B 2 fois dans le même arceau et séparée par 1ml? Merci d'avance pour votre réponse! Bonjour Fabs, après le rang 4 (= 127 DB), reprenez le diagramme à partir du 1er rang, mais faites le 1er rang comme indiqué (correction faite) : 3 ml (=1B), 1 ml, *1B dans l’arceau suiv, 1 ml, 1B dans la B suiv* répéter de *à* tout le rang = 252 arceaux. Bon crochet! Silly question, but I want to clarify, the pattern states to crochet with one strand of each yarn......that means putting then two strands together as if they were one strand, correct? Dear Kate, you are correct, this poncho is worked all the way with 1 strand Alpaca + 1 strand Cotton Viscose held together. Happy crocheting! Ik vind hem prachtig ,hoop dat hij niet te moelijk is ,ben pas beginner met haken. Dear Leya, in the diagram 1 symbol represents 1 st, text for symbol is just above the diagram. You first work the whole diagram then work it once again but this time you start at the arrow. Happy crocheting!